April 1, 2019 — April is celebrated nationwide as Donate Life Month. National Donate Life Month was instituted by Donate Life America and its partnering organizations in 2003 and features an entire month of local, regional and national activities to help encourage Americans to register as organ, eye and tissue donors and to celebrate those who have saved lives through the gift of organ and tissue donation. This month Zoe Anderson’s family members, friends, business associates and likely most of the residents of Fishers, Indiana, will be promoting donor awareness as a way to thank the registered organ donor’s family who selflessly donated the liver that saved Zoe’s life one year ago. Carly and Seth Anderson were very excited to meet their third child. They were the parents of two sons, Brody and Keegan, and they were very much hoping their family would include a daughter. When their little girl arrived in February 2017, Carly and Seth named her Zoe. She was the perfect baby and completed the Anderson family beautifully. 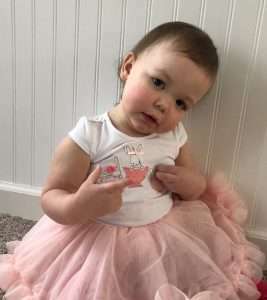 At just six weeks old Zoe was diagnosed with a rare liver disease called Biliary Atresia in which the bile ducts are abnormally narrow, blocked or absent. The infant’s body is not able to remove bile, which causes more damage to the liver and other problems with growth and nutrition. In most cases Biliary Atresia leads to liver failure. The Andersons were told Zoe would soon need a surgery, Kasai Portoenterostomy, which would ‘buy some time’ before her second surgery — a life-saving liver transplant. 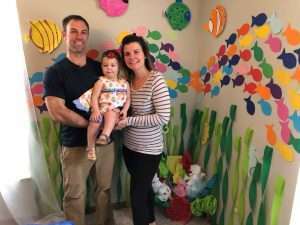 When Zoe was just about six weeks old, she required frequent and sometimes lengthy hospitalizations at Riley Hospital for Children in Indianapolis. Not knowing their baby was going to be born with a life-threatening disease, Carly and Seth had been planning and preparing for a move to a new home following Carly’s delivery. That move became tremendously challenging as Seth and Carly had to take turns at the hospital at Zoe’s bedside 24 hours a day, seven days a week. Carly remembers the stress of packing up and moving … travelling back and forth to the hospital … experiencing tense times at Zoe’s bedside … and trying to maintain a sense of normalcy for their boys. “At times it felt like we would not survive the coinciding of these two, major life stressors,” Carly said. After Zoe’s Kasai surgery, she was released to go home — the Anderson’s new home in Fishers, Indiana. Due to the unknown progression of Zoe’s disease, future hospitalizations and an eventual life-saving transplant, it was decided Carly would become a stay-at-home mom and put her career as an American Sign Language Interpreter on hold. 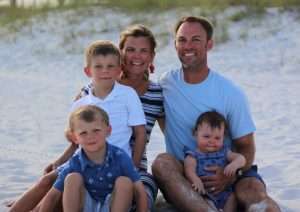 It was a crazy time for this family of five, but especially for Carly who remembers constantly juggling the competing and demanding needs of three children, one of whom was medically compromised, which required management of medical records, non-stop appointments and constant care. There were also numerous trips back and forth to the transplant center in Indianapolis and to various doctors’ appointments. As the summer months faded into fall Carly continued to manage the family’s hectic schedule. She describes Zoe’s health as ‘fair’ during this time period. Feeding Zoe was an ongoing struggle for Carly and Seth. But with the help of a feeding (NG) tube that Carly and Seth had to learn to use at home, Zoe steadily gained weight. Their baby girl was always pleasant and good-natured but simply did not have the energy to do anything. Zoe was hospitalized for a week during the fall due to adenovirus, but the Andersons once again made it through this inpatient stay due to the support of family and friends. However, the inevitability of a liver transplant was always resting heavily in Carly and Seth’s hearts. Zoe’s liver numbers never really normalized after the Kasai procedure. Carly had done extensive research on Zoe’s disease and was well aware it was only a matter of time before her condition would worsen. Since there was no way to know what was coming for Zoe, they decided to be as prepared as possible for what might lie ahead. Part of that preparation was researching pediatric liver transplants, which included reading about the lifetime costs associated with Zoe’s disease and liver transplant. After much research Carly placed a call to the Children’s Organ Transplant Association (COTA) in late November 2017 to learn more about fundraising for transplant-related expenses. COTA uniquely understands that families who care for a child or young adult before, during and after a life-saving transplant have enough to deal with, so COTA’s model shifts the responsibility for fundraising to a community team of trained volunteers. COTA is a 501(c)3 charity so all contributions are tax deductible to the fullest extent of the law, and these COTA funds are available for a lifetime of transplant-related expenses. “Something eye opening I read that will forever be etched in my mind is ‘transplant is not a cure for liver disease, but a very good treatment.’ We had been suddenly put into a medical situation that we could not have possibly predicted and it had a lot of implications for our family including financial,” Carly said. She remembers feeling hesitant about starting a COTA fundraising effort in Zoe’s honor until Zoe was officially listed for transplant. However, conversations with COTA staff members and even COTA’s President Rick Lofgren helped Carly and Seth better understand the financial implications the family would face in the short term and also in the long term. The launch of the COTA in honor of Team Zoe A fundraising effort was actually perfectly timed. Just after the holidays Zoe was hospitalized with a severe liver infection, which resulted in the baby girl being listed for liver transplant in January 2018. At this point transplant reality hit the family hard; the frequency of Zoe’s medical appointments and lab tests started to increase even more as her health continued to decline. During an evening in mid-March, Carly and Seth received the much-anticipated call letting them know there was a potential donor liver available for Zoe. 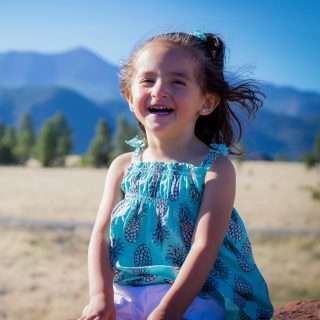 “Prior to transplant, we not only had to grieve and experience so many emotions as we watched Zoe battle liver disease, we also had to start to wrapping our minds around the fact that another family had no idea what was coming. Being the parents of young children and knowing Zoe’s donor was likely going to be a young child caused us to experience a myriad of emotions,” Carly said. “It is hard to find words to express what it means that in the midst of unfathomable grief, a family could make the decision to allow their little loved one to give the Gift of Life to others. Zoe received her gift of life, a new liver, the day after they received the call. Three months after Zoe’s life-saving transplant Carly shared these observations. The difference before and after transplant is remarkable. Zoe truly started coming to life right after transplant. Her skin and eye color rapidly changed from yellow to very healthy and normal looking. Her appetite picked up and she is eating and drinking like a normal toddler. She no longer needs any fortified or special formula to gain weight, and she is drinking regular whole milk. She is talking, signing, moving and she is happy and healthy. We finally feel like she is no longer a prisoner inside of her own body — she is able to finally interact and is full of energy. She has caught up so quickly we almost cannot believe it! Having big brothers to keep up with definitely is motivating for Zoe. She even laughed for the very first time soon after transplant. We truly feel that because of the Gift of Life she received, we are able to witness a miracle every day right before our very eyes. Today Zoe is almost one year post transplant; Carly and Seth are in awe as they watch their little miracle continue to grow and develop into a toddler. With that in mind, Carly explains there has not been a day that has passed when they have not thought about Zoe’s donor angel and family who gave Zoe the gift of life. Zoe is a very busy girl who is always keeping up with her two older brothers. She had a language explosion this year and talks in full sentences, which has become quite entertaining for the family to witness all of her humor, sass and personality as she expresses herself. It is indeed a stark contrast to last year when she was so sick and had very little energy. According to Carly, Zoe LOVES to sing and dance. Her favorite things include anything her brothers are doing in addition to coloring, Thomas the train, and playing pretend with her dolls. “We are feeling extra grateful as we approach Zoe’s one-year post-transplant. We are so thankful for COTA and all of the people in our lives who have supported our family’s transplant journey,” Carly said. Nationwide, April is the month that is dedicated to raising awareness about the need for registered organ and tissue donors. Many COTA families are waiting for the life-saving call Zoe and her family received. You can visit www.RegisterMe.org to learn more about registering to be a life-saving donor. Every day 20 people die waiting for an organ transplant here in the United States. One organ donor can save eight lives.